Looking almost like an oil painting, from a hill in El Granada, enjoy this breathtaking view of Miramar, with the Miramar Beach Inn, (you’ve got to pick it out) standing almost by itself, overlooking the ocean. 30 years ago. 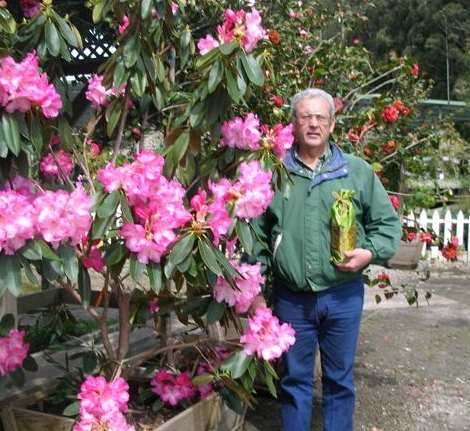 Ron’s nursery is located on Hwy 92, north side, a mile or so from the historic town of Half Moon Bay. 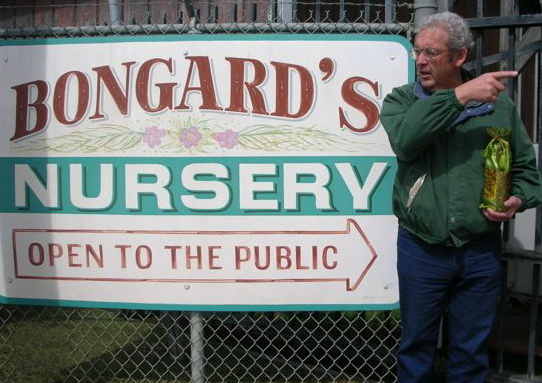 Bongard’s Treescape Nursery is a fun place to visit–be sure to see the giant palms and other really big plants in the greenhouse. I know youâre from the âold schoolâ? and your tv sales pitch is directed to computer illiteratesâbut I am sick and tired of you, the lady and the three- year- old daughter who knows more about computers than all of you. BTW: If the kid exists at all, sheâs probably in juvenile hall by now awaiting sentencing. Isn’t it time for a new commercial with real computer geeks and nerds? Iâll probably learn to hate that one as much but at least itâll be a change. 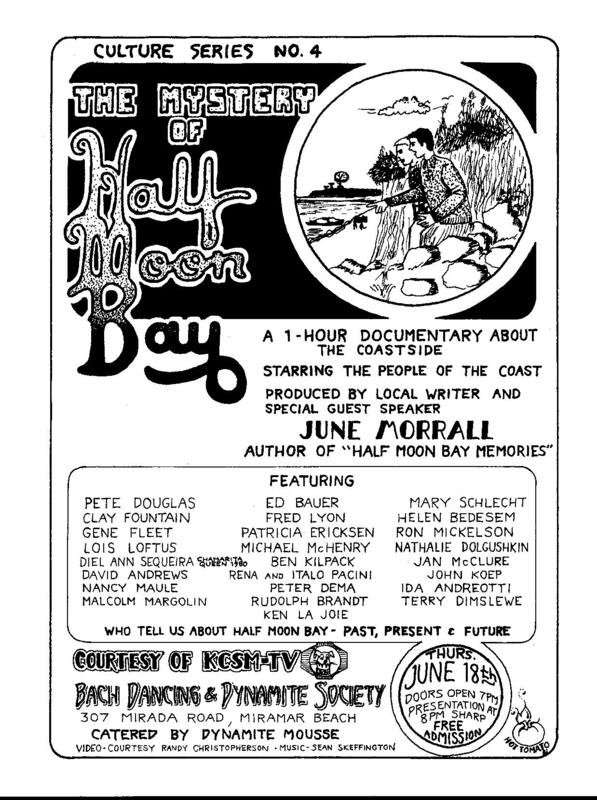 Many years ago I produced/wrote a 60-minute documentary called âThe Mystery of Half Moon Bayâ?. The way I pitched the project and sold it made me feel like a waitress at Schwabs discovered by a famous Hollywood producer. Okay, maybe thatâs way too romantic. I was passionate about my idea of putting the colorful Coastside** on the small screenâand I appeared at the offices of KCSM-TV in San Mateo, landed an appointment with Stewart Cheifet, the general managerâand I can still visualize myself seated on the opposite side of Cheifetâs desk, a very serious look on his face as he took an egg timer and turned it upside down. âYouâve got three minutes,â? he told me, sternly. I noted he had one of those fine broadcast voices, honey-coated. Maybe it was really one minute and maybe it wasnât an egg timer but one of those little glass âthingiesâ? with sand inside that tells how much time has passed by dripping grains of sand. To make the hour show, I was paid a tiny sum but I happily spent nearly a year of my life absorbed with it. I was assigned to work with longtime director Rick Zanardi, and cameraman Jim Threlkeld– and we went out in the field to shoot this doc. They were experienced and great to work with. What I most regret now is that I didnât have the financial means to keep the raw footageâthere were some oldtimers, now gone, interviewed on those precious tapes, gone forever. 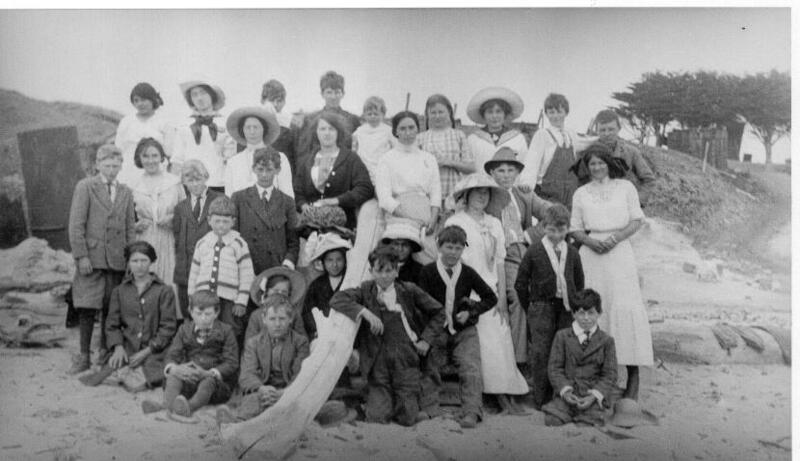 Before âMystery of Half Moon Bayâ? 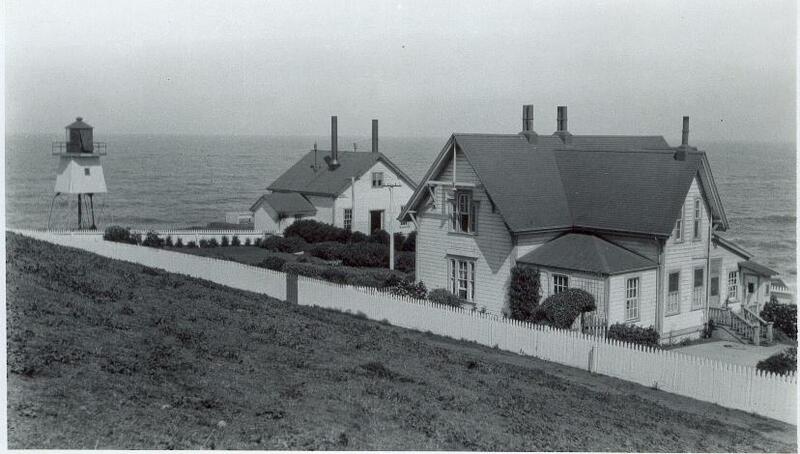 aired on KCSM, there was a premiere at the Pete Douglas Beach House in Miramar Beach. I was so nervous I didnât go into the concert room where âMysteryâ? was being shown on a huge tv screen, donated via the contacts of Coastsider John Essa. I loved the show and its theme– that Half Moon Bayâs historical failures were actually the reason for its success. KCSMâs publicist took ads out in TV Guide and there were newspaper interviews. 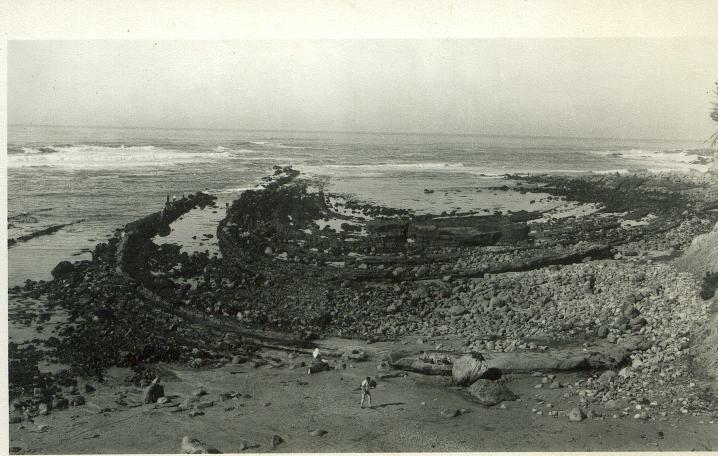 Before vanishing from the screen, âThe Mystery of Half Moon Bayâ? was aired several times. For a long time my copy of âMysteryâ? sat with my books on a dusty shelf. One day I was invited to a meeting organized by the folks who founded MCTV, the local access station. To me the words âlocal accessâ? seem painfully bureaucratic words that donât convey anything meaningfulâcertainly not what the founders intended: a tv station where local talent could produce shows and have the creative result seen by Coastsiders. The small group met at the Half Moon Bay library. Thatâs where I encountered Connie Malach and her husband Mike. Theyâd recently moved from San Francisco to El Granada. MCTV was just being born and Connie and Mike didnât own a vast video library; they didnât have a lot of shows to air. When I told them I had a tape of âThe Mystery of Half Moon Bayâ?, they were excited. Yes, they wanted to air it. Almost immediately âMysteryâ? (with permission from KCSM) hit the local airwaves. When MCTV hosted their first âSeals of Approvalâ? award ceremonies at the glamorous golf course south of Half Moon Bay, âThe Mystery of Half Moon Bayâ? won a âsealâ? for the most popular show! A most thrilling moment in my life. My MCTV trophy sits proudly on my bookcase, a symbol of the mutual affection between the Coastside and me. *Stewart Cheifet injected a tremendous dose of optimism and much-needed change into KCSM-TV.Whoever hired him should receive an award. 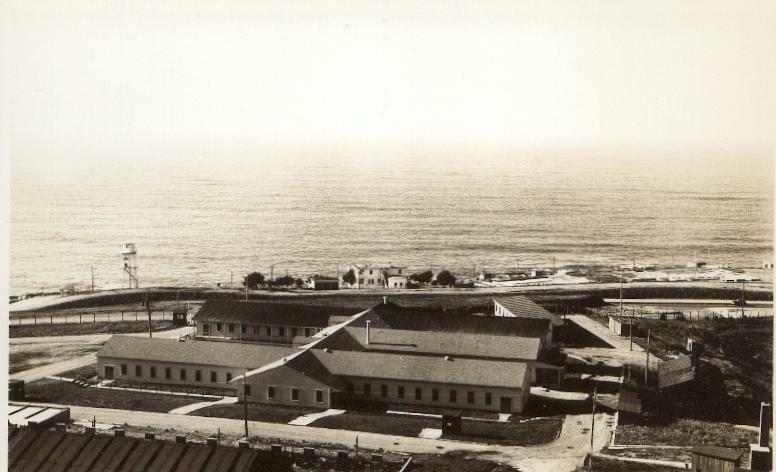 As the new GM, Cheifet had the staff going out into the real world for the first time. They were following politicians running for office and suggesting ideas that would have been nixed before. Stewart Cheifet was innovator and everyone at the station came to life–I know because I was a witness to it. 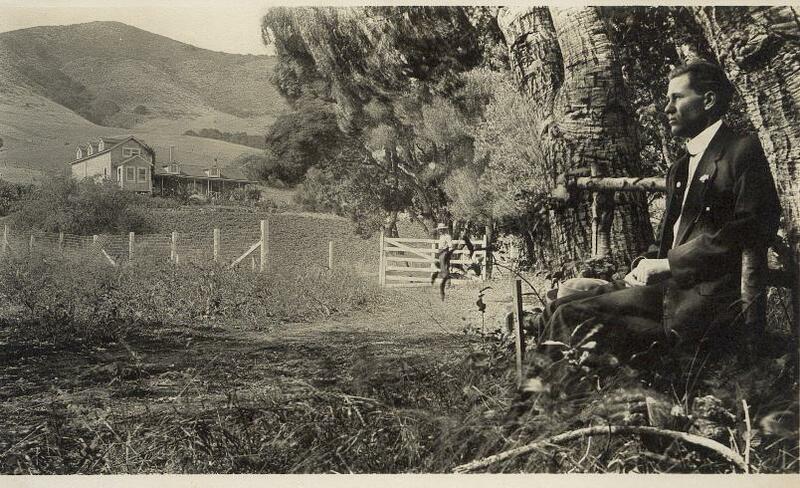 At San Gregorio Farms, in the 1970s, the main crops weren’t artichokes or chocolate milk cows. I’ll give you one guess…..Nope. How about a super-agricultural earthworm, a hybrid called “the small miracle”? The 300-acre ranch at San Gregorio had its quota of conventional farm animals: chickens, ducks, horses, cows, pigs and ponies but the 1970s was the decade of “everything to do with gardening”–organic compost, crocheted potted plant hangers, ferns, ferns, ferns–and so the earthworm, long neglected as a soil enchancing creature, slithered to its very brief moment of glory. I knew the owners, Channing and Corri Pollock, because my Ex, a talented contractor, turned their woodworking concepts into reality. 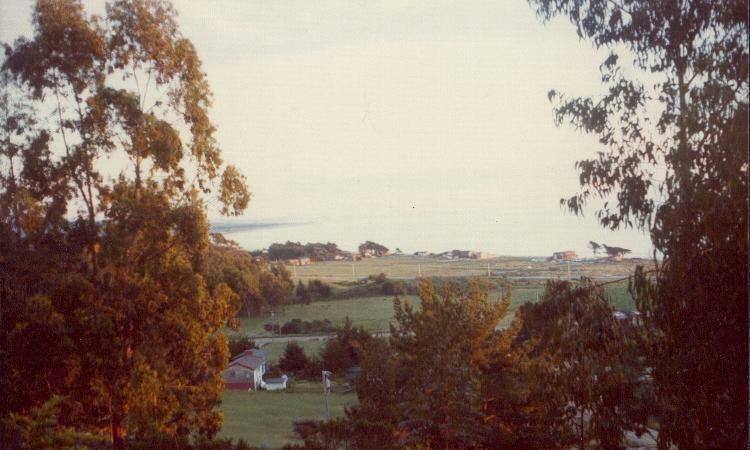 The Pollocks visited their ranch often, spending days and evenings there–but actually lived in a unusual home overlooking the sea in Moss Beach. They were an extraordinary couple. He had been a tuxedo-ed magician whose magical spells made his white doves vanish on the wildly popular Ed Sullivan Show in the 1950s and she was a beautiful, artistic and wealthy woman. Now retired, they were drawn to the soil. “We want you to meet a small miracle,” the San Gregorio Farms pamphlet explained. These hearty creatures were not like fleas performing tricks at the circus; they were hard workers. 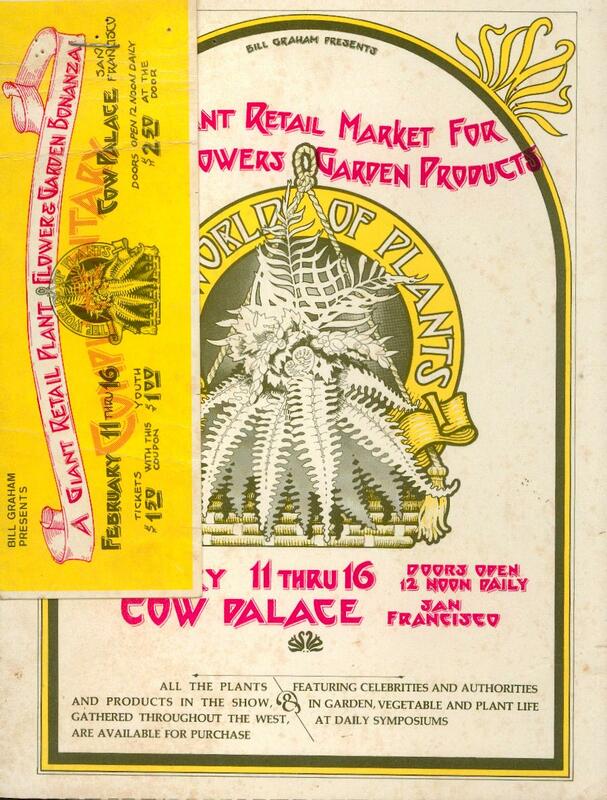 In order to get the word out as to how valuable these critters were, the Pollocks signed up for a large display booth at the legendary rock impressario Bill Graham’s “World of Plants” exhibition held at the Cow Palace. Channing recognized the theatrical possibilities. The entire event had to be choreographed. 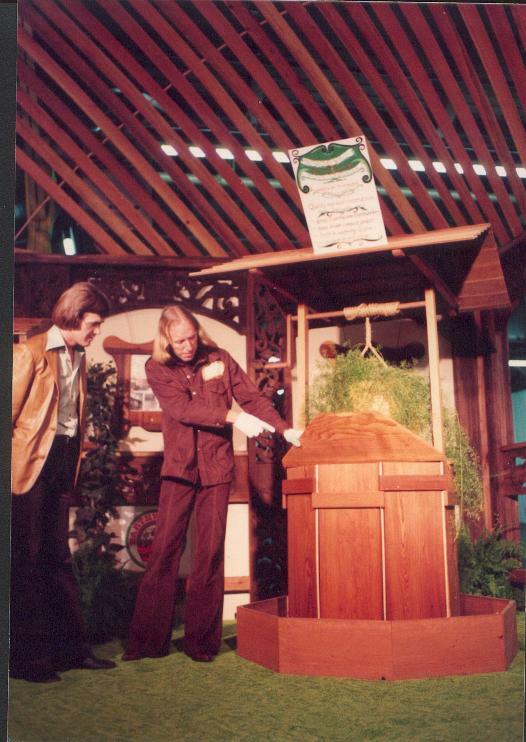 Corri designed the brown costumes, even the shoes (see photo of Roland Reese pointing to a custom-made container.) for the booth attendants who answered the public’s questions with the hope of selling worms. The Pollocks intended to spend full time at the trade show and to be comfortable they brought exquisite furniture from their Moss Beach living room. Oriental rug. Coffee table. Couch. 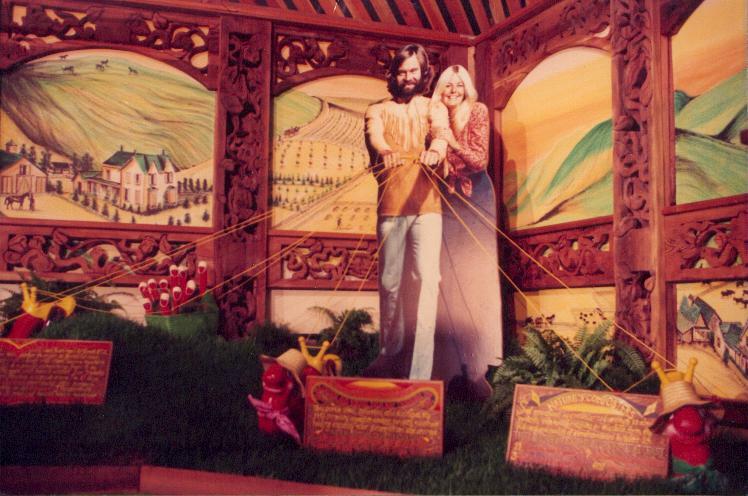 Constructing the display booth turned into a monumental task because the Pollocks required the booth to be hand-carved, using only the earthworm as the motif. Throughout the space, the earthworm was the dominant theme. Even the redwood containers, home to the earthworms, were custom-made, including one in the photo that looks like a pyramid. The budget buyer carried his or her earthworms home in a clever simulation of a Chinese take-out box. During the final inspection of the booth, the Pollocks, to their horror, noted the main wall of the booth was blank. Emergency! It needed something quick. A mural? How about a life-size photo of a pair of beautiful young people holding the reins of super earthworms a they till the soil. Mark and Flower looked just great–they were a gorgeous couple often asked to model. Michael Powers, the Miramar Beach photographer, took pictures of them in the flower fields of Half Moon Bay or riding on the white sandy beaches. But they’d never shared the camera with earthworms before. (See photo of Mark and Flower below). 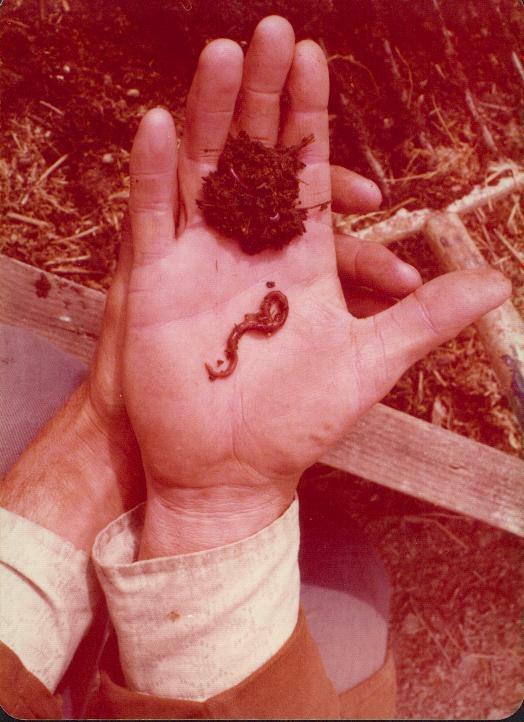 San Gregorio Farms was the talk of the Bill Graham “World of Plants” exhibition but the hybrid earthworms never were launched as a business. Everything the Pollocks did they did with style and grace–and the earthworm caper was no exception. Note: Channing Pollock passed away at age 79 in Las Vegas on Sunday, March 19. His wife, Corri died a few years ago in Moss Beach. 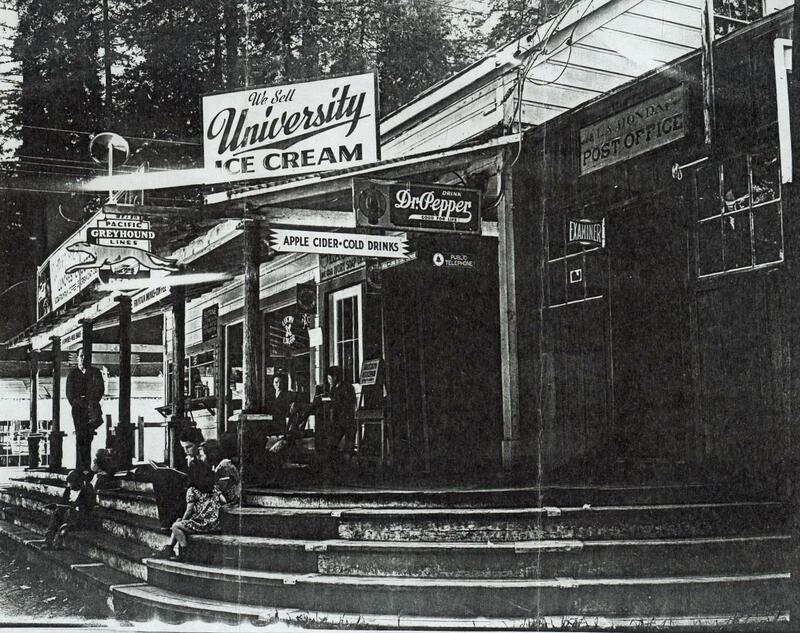 La La La Honda…remember when…. 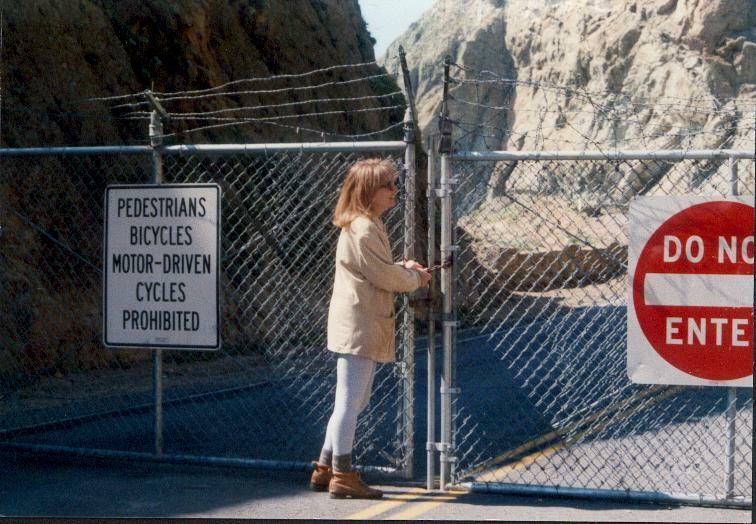 Commuting Coastsiders are holding their breath….but officials say it’s only temporary, a matter of hours– intermission time at Devil’s Slide. 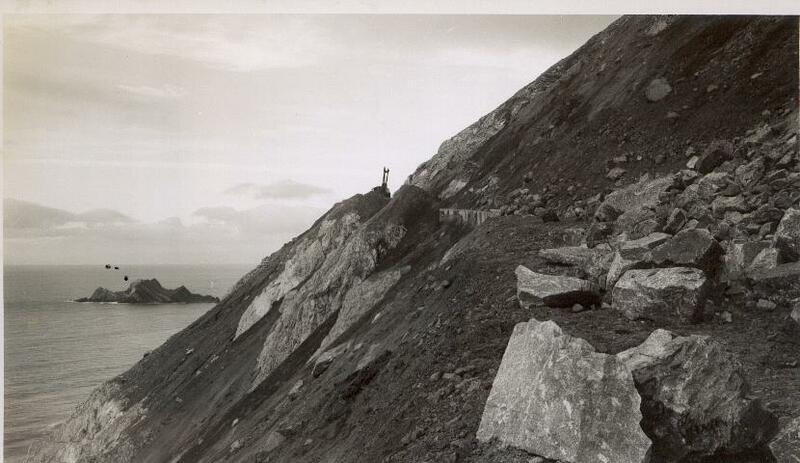 I guess you should know that I will miss the old Devil’s Slide route. Thinking about getting stuck in traffic inside a tunnel makes me feel helplessly claustrophobic. I hope they put in skylights and picture windows! âDown the Ocean Shoreâ? *âFrom “San Francisco: A Chapter in Your Life”, a pamphlet encouraging people to visit California after WWII, published by Californians, Inc, 1946. I inserted the photos by R. Guy Smith. (âS1â? = Highway 1âautomobile tour begins near Sharp Park, Pacifica, then proceeds south to Half Moon Bay and Pescadero). .â? â¦On S1 you follow in reverse the way of the Portola expedition up coast in 1769, expedition that discovered San Francisco Bay, led to settlement of San Francisco in 1776. “Near mouth of San Pedro Creek, 8.1 m, guarded by lofty San Pedro Point, Portola expedition camped by an Indian village Oct. 31, feasted on mussels pried from rocks. Portola sent Sgt. Ortega with party to scout eastward. 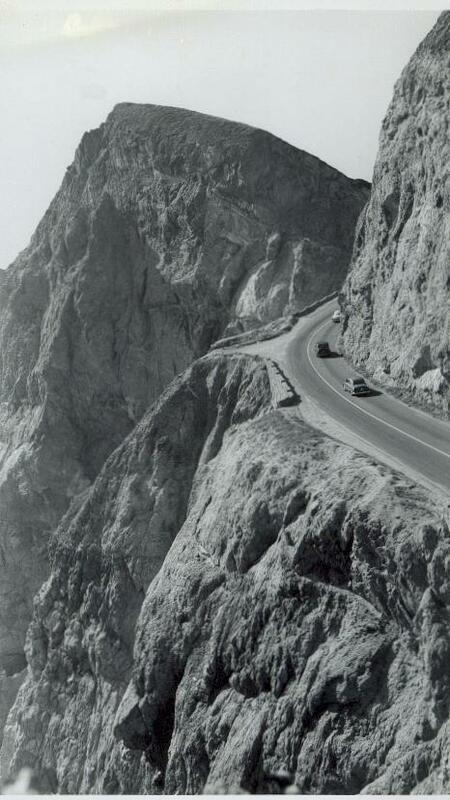 As they climbed to top of ridge they saw vast expanse of San Francisco Bay, never before seen by white men. Here, in Pedro Valley, begin fields of silver-green artichokes which supply bulk of this delicacy for nation.